Kitchen & Bath Depot offers some creative kitchen island ideas for you to consider. 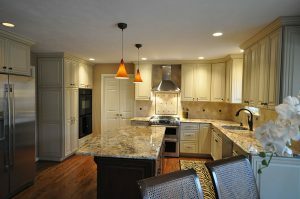 If you’re considering a kitchen remodel in the future, including a kitchen island should be a top priority. Kitchen islands create functionality and charm to any kitchen, as well as boost your home’s resale value by a significant amount. Even if you don’t require the extra cooking space, you can still use your kitchen island to its fullest by maximizing some of the other benefits they provide. Here are some kitchen island ideas for you to consider during and after the remodeling process. Adding a kitchen island with seating can happen during the kitchen remodel process. However, if you’ve recently remodeled and left the island out of the equation, you can also choose it as a standalone option. Most homeowners probably hold having an island near and dear to their hearts even if they don’t have for it. One possible alternative is to use a rolling cart to function the same way as an island could. That way, you can have extra storage space for pots, pans, utensils, and lids. Plus, it can serve as another workspace. But when you choose a true kitchen island, you can have another space for a pantry. Perhaps you’d like to set up your island as a coffee and tea bar? You can go ahead and do that. Pull-out shelves are another customization option you can choose to make your life much easier. Here are two other possibilities to consider, too. One of the simplest kitchen island ideas is using your new structure as additional storage. You might have a variety of cookbooks or magazines that you like to keep in the kitchen. It makes getting inspiration so much simpler if you have your kitchen set up that way. You can also save room in your living room when you keep cooking and baking guidebooks in your kitchen – and the same goes for when you want to sling drinks for your next cocktail party. No matter what you’d like to do, it’s a smart idea to save some space on your counters by using your kitchen island as a bookshelf. Don’t hesitate to entertain your friends and family in your redesigned kitchen this spring. How? When you use your kitchen island as a hangout spot, and you can also place more chairs around the island to make a breakfast bar. Having access to your family or guests is always an advantage while cooking and preparing meals, so using your space as an informal dining area is a welcome change from the regular table, as well as being one of the better kitchen island ideas out there. More Kitchen Island Ideas for Your Next Kitchen Remodel! This entry was posted on Wednesday, March 28th, 2018 at 4:53 pm. Both comments and pings are currently closed.